Hello! 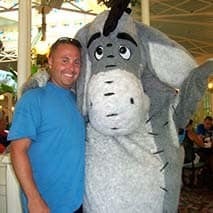 My name is Jamie and I would love to be your Disney Vacation Planner! My love for Disney began with my first family trip to the World in 1998. Since that time, it has been my family’s favorite vacation destination. In total, I have been fortunate enough to travel to DisneyWorld 11 times. I have also had opportunities to be involved with sports teams that have played at the Wide World of Sports Complex. In 2012, I made the most magical of memories and proposed to my now-wife during the IllumiNations fireworks show at Epcot. I have stayed at various value and moderate resorts and have visited deluxe resorts. In my trips to the World, I have visited many different quick service and table service restaurants and can offer expertise in these areas. In 2005, I was also afforded the opportunity to visit the original park, Disneyland. Throughout my trips to Disney, I have made many magical moments that will last with me forever. As your Pixie agent, I will do whatever I can to make sure that your vacation experience is truly magical. I am a proud graduate of the Disney College of Knowledge and can offer many tips and tricks for the best possible experience.